Figure 1. 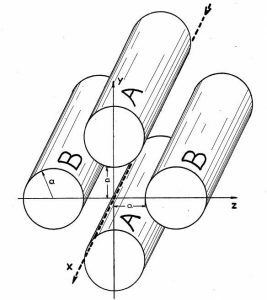 Basic geometry of a quadrupole mass filter, showing the two pairs of rods with the ions passing down the center of the arrangement (dashed line “x”). In 1989, Wolfgang Paul won the Nobel Prize in Physics for this work. Image from the original patent by Paul and Steinwedel (1956). There are a variety of strategies for separating an ion beam into its individual components. Perhaps the most well-known method involves passing ions through a perpendicular magnetic field, causing the beam to be deflected at a right angle to the magnetic field lines. The amount of deflection is dependent upon the momentum:charge ratio of a given ion; in the case where all components in the ion beam have the same, or very similar, kinetic energies, the radius of curvature becomes a function of the mass of any given ion. A second common strategy involves passing the ion beam down the central axis of a quadrupole mass filter, which is basically four parallel rods to which time-varying voltages are applied (Fig. 1). Only those ions with the selected mass:charge ratio will travel through this filter, all other ions will be removed from the ion beam. Quadrupole systems can rapidly change the mass:charge ratio that is transmitted; a limitation is that one must select which elements will be investigated in advance of a given analysis. Unfortunately, should one wish to analyze the contributions of, say, 20 different elements in a complex ion beam, then the average detection time for any single element will be less than 5% of the total analysis time – with 95% of the ions for that species being “wasted” during those periods when other ion species are being observed. Particularly problematical is when components of the ion beam are highly transient, such that the composition of the ion beam changes over the course of the few hundred milliseconds that one might need for a single sweep of the selected mass sequence. When measuring the aerosol particles generated by a laser ablation system, it is exactly such transient signals that are provided. In contrast to the two techniques above, time-of-flight (TOF) mass spectrometry works on a completely different principle. If an ion has a known energy, usually that provided by the voltage potential between the ion source and the mass spectrometer, then the time needed for the ion to cover a known distance can be used to identify its mass. For common types of such laboratory instrumentation, a flight distance up to a few meters is the general rule, with travel times commonly in the range of a few to a few 10s of microns. In order to determine the time required to cover the given distance, one obviously needs to know both the start and end times for each and every ion being analyzed, and these values need to be known with excellent precision. The end signal is typically defined by the arrival time of the ion at the detector – modern detectors can routinely operate in the low-nanosecond performance range. The start time, on the other hand, is commonly defined by the pulsing of the ion extraction voltage. This strategy is beset by the problem that the voltage responsible for injecting ions into a TOF mass spectrometer can be active only during a brief time window. The system must then be switched off to allow the heaviest ions in the system to travel to the detector, otherwise the light elements (e.g. hydrogen) from a subsequent pulse might overtake the heavy species (e.g. uranium) injected during the preceding extraction pulse. This was a shortcoming of early TOF systems: they typically spent most of their time in a passive mode waiting for ions to be cleared from the system. It was not uncommon that for early systems to spend 99% of the time in passive mode, waiting for ions to finish traversing the TOF segment, resulting in slow rates of data collection. On the other hand, the TOF method has the major advantage of detecting all (or nearly all) ion species, without the need to preselect which elements are of interest. Furthermore, detection is effectively simultaneous, meaning that even transient signals lasting <10 milliseconds cannot “sneak through” undetected, regardless of which element one is investigating. Figure 2. 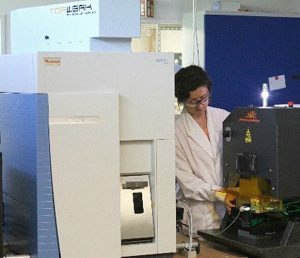 Swiss mass spectrometer manufacturer TOFWERK’s icpTOF system being used in conjunction with a Photon-Machines laser ablation system. The vertical mount geometry has the advantage of reducing the amount floorspace needed for the instrument. The horizontally oriented time-of-flight segment is visible at the top of the instrument. Photo: M. Cubison (2016). So what does this all have to do with laser ablation? With its transient signals and with the common desire to quantify the abundances of all possible elements, TOF mass spectrometry has some very attractive features for the laser ablation community. For this reason, I contacted the company TOFWERK AG, (based in Thun, Switzerland). Founded in 2002, TOFWERK is one of a very small number of instrument manufacturers combining inductively coupled plasma (ICP) ion sources with TOF technology. Importantly, over the past few years, quantitative results have begun to appear in the scientific literature [Tanner and Günther (2008) being among the first], providing a picture of what this technology can really achieve. In 2012, TOFWERK produced a complete prototype instrument for performance testing, going on to market their icpTOF instrument to the scientific community in 2014 (Fig. 2). This system is built around a modified Thermo Fisher ICP-quadrupole instrument where the exiting quadrupole mass filter has been replaced by an ion transport segment followed by a TOF mass filter plus ion detection system. Importantly, the TOF part of the system has been designed and is being built in-house at TOFWERK, meaning that the ion optics are fully optimized for the properties of the ICP ion source. The icpTOF system is marketed as a stand-alone mass spectrometer, where the customer has many options for purchasing the “laser + optics + ablation cell” from third party vendors. Figure 3. Simplified layout for the ion optics of the icpTOF system. Red: Path of the ions through the system. Blue: Modified Thermo Fisher ICP system with quadrupole replaced by transport segment. Yellow: ToF mass filter. 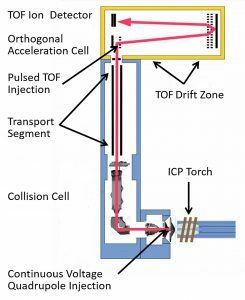 Ions from the laser ablation cell would be injected into the plasma torch at the lower right of this diagram. Base image kindly provided by TOFWERK. TOFWERK has employed a well-known, but nonetheless elegant, geometry to improve the ion throughput of their instrument, namely the use of an orthogonal ion acceleration cell for their TOF segment (Fig. 3). This arrangement, now widely used by many TOF systems, allows the plasma ion source to operate continuously, injecting a non-pulsed ion beam into the injection zone of the TOF mass filter [see review by Guilhaus et al. (2000)]. It is actually the injection voltage within the TOF segment that is modulated, typically operating at a frequency of 33 kHz, equivalent to a cycle time of only 30 µs. TOFWERK has not disclosed the pulse width for the injection of ions into the drift sector, but I could imagine this to be on the order of 30 ns or perhaps less. If my “guestimate” is correct, then the system would have a duty cycle of only 0.1% (i.e. 30 ns/30 µs). This is where the orthogonal geometry comes into play. During the vast remainder of the 30 µs cycle, when ions are not being injected into the time-of-flight drift zone, ions continue to be delivered to the TOF injection zone where they become available for the next extraction pulse. In other words, the orthogonal geometry acts much like an ion storage device, greatly helping to improve the sensitivity of the system. Importantly, this system still delivers good mass resolving power of ~3,000 (TOFWERK 2016), which would be sufficient to split the difference in mass between, for example, 56Fe+ (mass 55.9349 Daltons) and the molecular interference 40Ca16O+ (55.9575 Daltons), supposing that any CaO+ molecule survived passage through the up-stream collision cell. This mass resolution is superior to that provided by most quadrupole systems. Now, I would like to turn my attention to two specific examples of laser ablation inductively coupled time-of-flight mass spectrometry (LA–ICP–TOF–MS) from the geochemical literature. The first application I highlight is the use of TOF technology for the generation of element distribution maps. Gundlach-Graham and Günther (2016) compared the performance of quadrupole and TOF systems, where the simultaneous multi-element acquisition capability of their TOF system was coupled with a low volume ablation cell providing a washout time – the time needed to flush all ablated sample particle from the ablation cell – of only circa 10 ms. In contrast, their quadrupole system operated with a more conventional large-format ablation cell providing a washout time of ~500 ms, necessitated by the requirement of the mass spectrometer to operate in peak jumping mode. Gundlach-Graham and Günther (2016) report that imaging using a TOF system was ~1,800 times faster than the established methodology based on a quadrupole mass spectrometer. On the other hand, Gundlach-Graham and Günther (2016) report that when using a 1 µm diameter laser spot, they could achieve a detection limit of ~100 µg/g for their TOF system, whereas the quadrupole system managed a better detection limit of ~8 µg/g, but only for a single isotope. The second application I want to highlight is the use of laser ablation technology for quantifying trace element abundances in natural fluid inclusions (see also Wagner et al. 2016 this issue). In this case, one of the largest technological challenges is the inherently transient signals that are generated when the wall of a fluid inclusion is initially breeched. Harlaux et al. (2015) compared three differing mass spectrometer classes: a quadrupole system, a sector field system – both these being peak-hopping systems – and a TOF spectrometer system from TOFWERK. The same laser system was used in all three cases but, with respect to the ablation cell, the two peak-hopping technologies employed large cylindrical cells whereas the TOF experiments were based on a low dispersion (small volume) cell so as to take advantage of the quasi-simultaneous acquisition capability of a TOF detector. The conclusion of these authors is that, of the three technologies, the sector field instrument provides the best limits of detection. However, thanks to the short 30 µs cycling time of the TOF system and the better signal:noise ratio provided by the small geometry ablation cell, TOF technology provided the best overall analytical uncertainties. So what does the future hold? It will take another couple of years to have a clear picture of LA–ICP–TOF–MS technology’s relative strengths and limitations. More information is needed especially in terms of TOF performance with regards to trace element quantification. However, based on current information, the future looks bright. I think scientists considering the purchase of laser ablation trace element instrumentation would be well served to investigate the TOF alternative in more detail. As for myself, having worked for three decades in the field of isotopic microanalysis, I am eager to know how the icpTOF tool performs for isotopic and U–Th–Pb dating. TOFWERK (2016) icpTOF Full Mass Spectra of Short Transient Signals. TOFWERK AG company brochure dated 02 June 2016, 35 pp.